In this remarkable volume, Michael Green provides an abundance of information and insights while examining the development of grand strategy and American power in the Asia Pacific from 1783 until 2015. This is indeed an evidence-driven analysis as indicated by 139 pages of annotated notes. I hasten to point out, at this point, that I am not an historian, much less an authority on military history. Green seems to have written this book for persons such as I, however, who have a keen interest in how thirteen colonies who established a new nation would evolve — over time — into the global powerhouse it eventually became and continues to be. In a review of By More Than Providence for The New York Times, Gordon Chang addresses a shared vision of “manifest destiny” that extended far beyond both western and eastern coastlines: “Protection of the Pacific, therefore, became a paramount concern. American presidents, diplomats, admirals and analysts may have disagreed on strategy, but the disagreements were mostly about how far forward to draw America’s defensive line. As Walter Lippmann noted, the United States was never isolationist in the Pacific. 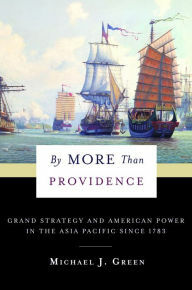 This book explains with rigor and eloquence why and how — throughout its history — the U.S. has had to secure its position in the Asia Pacific by more than providence. Early on, Michael Green notes that “the roots of modern American strategic thought on the Pacific have remained largely untouched by generations.” That is, I presume to add, until now.